Astronomers using ESA’s Herschel and NASA’s Spitzer space telescopes have detected surprisingly rapid changes in the brightness of embryonic stars within the well-known Orion Nebula. Images from Herschel’s far-infrared instrument and two of Spitzer’s instruments working at shorter wavelengths give us a more detailed picture of stars growing in the heart of one of the most famous objects in the night sky. The Orion Nebula is 1350 light years from Earth, and appears prominently in the winter skies for European observers. Sometimes referred to as the Sword of Orion, the nebula lies below the three stars that form the belt of Orion the Hunter, one of the most easily recognised constellations. It is one of the few nebulas visible to the naked eye and is a popular target for amateur astronomers. The nebula contains the nearest site of massive star formation, with intense ultraviolet light from hot young stars causing gas and dust in the region to glow. Inside that dust – hidden at visible wavelengths – is a host of even younger stars, still growing in their earliest phase of evolution. A star forms when a dense cloud of gas and dust coalesces and then collapses under its own gravity, creating a central warm protostar surrounded by a swirling disc and a larger envelope. Much of this material will spiral in and collect on to the star over hundreds of thousands of years, before nuclear fusion is triggered at the core and it becomes a fully-fledged star. Some of the remnant gas and dust in the disc may go on to form a planetary system – as happened with our Solar System. A team of astronomers led by Nicolas Billot of the Institut de Radioastronomie Millimétrique, in Granada, Spain used Herschel to image the Orion Nebula region once a week for six weeks in the late winter and spring last year. Herchel’s PACS Photodetector Array Camera and Spectrometer detected cold dust particles in discs around the youngest protostars at far-infrared wavelengths. This was combined with archival Spitzer images taken at shorter, mid-infrared wavelengths, which show older, hotter objects. Astronomers were surprised to see the brightness of the young objects varying by more than 20% over just these few weeks, since the accretion process should take years or even centuries. They now have to explain why this is happening. One possibility is that lumpy filaments of gas are funnelling from the outer disc towards central regions near the star, temporarily warming the inner disc and leading it to brighten. Another scenario is that cold material is piling up at the inner edge and casting shadows on the outer disc, causing it to darken temporarily. In either case, it is clear that the gestation of baby stars is anything but a smooth, uniform process. “Yet again, Herschel observations surprise us and provide more interesting insights in to what happens during the very earliest phases of stars and planet formation,” comments Göran Pilbratt, ESA’s Herschel Project Scientist. 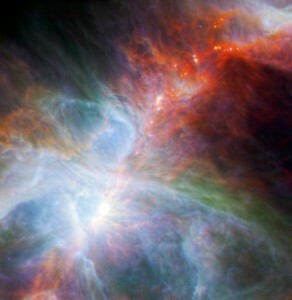 One Response to Stars flicker in the heart of Orion. Space flights: Book your place in space ! Thats how virgin galactic is attracting customers to fly into space. 1 ticket will cost you a mindblowing 200.000 US dollars. Already more then 400 people have bought a ticket into space. Off course we all .